FUBAR Comic-Con signing! Awesome Toy Blog! Weird Al! Comic-Con is just a few days away, and it's shaping up to be even bigger than ever before. I'm trying to pack, make last minute plans and figure out some semblance of a schedule for the coming week. I'm flying in to San Diego a day earlier than I did last year, so hopefully that helps me get accustomed to the west coast in time for the show...but let's face it, no one is ever really prepared for Comic-Con. I'm hoping for the best. Plans don't get much more last minute than this, but I'm still finalizing a few details on some exciting news. There will be a small FUBAR signing at Comic-Con, complete with a few exclusives to boot. The picture at top is of our con exclusive poster, measuring 11x14 and featuring the "Ace of Spades" Free Comic Book Day cover. It sells for five bucks! The signing will take place on Friday the 25th in the small press section, booth M-06. I'll be there along with Chuck Dixon and Jennie Wood to sign some books and say hello. Eric Esquivel and Lesley Vamos are scheduled to make some appearances as well! The time for the signing is tentatively set for 3:30-5:00, but we're still working out individual schedules. Let's keep our fingers crossed. ...and the back has a place for autographs! There'll also be a special item for backers of the "Mother Russia" Kickstarter. Cryptic! The Awesome Toy Blog is a great site with lots of great information on, well, toys in general, but I use it most to find a list of convention exclusive merchandise. The site compiles it and I scan it to see what I need to get for SDCC and other conventions (but mostly SDCC). 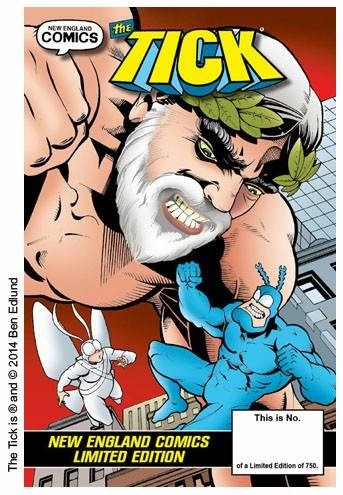 The site recently put up a post about the Tick exclusives from New England Comics! I'm glad someone (uh...) tipped the site off about them! In the category of "dream come true that might quickly turn into a nightmare" comes news that "Weird Al" Yankovic will have a panel all to himself at Comic-Con on Saturday. This is fantastic news until you find out that the panel is a limited ticketed event and you'll probably have to wait in line for seven hours just to get a chance at a ticket. There are better ways to do this, Comic-Con...just look at Nerd HQ if you want to know how to do it right! Regardless, I'm going to try to get into the panel and see Al once again, so I hope that it's relatively painless. Al just released his new album, "Mandatory Fun", which is, of course, a gift to humanity. I'm doing my best to learn all the lyrics to the new songs before Saturday. Above is the video for what might just be my favorite song on the album, "Foil"! Watch and enjoy. And then go buy the album. Best of luck to all heading out to San Diego for what is sure to be a great, manic time. I'm sure to come back with lots of pictures. Original art alert! 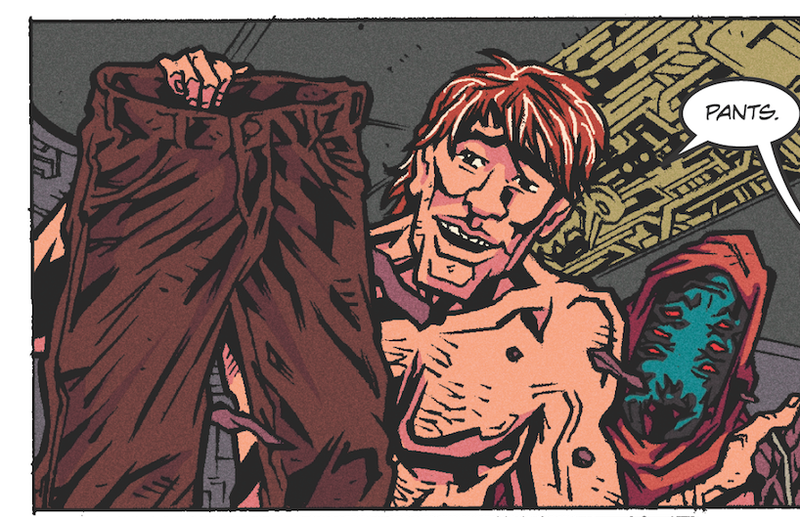 Naked Man at the Edge of Time, FUBAR, FF color guides and more! I landed a few items of original art recently, so I might as well share 'em with the world. And you, faithful reader. ...pants. What a great word. This artwork is on 8.5x11 inch paper...which means if I choose to frame it, it'll be a cinch. Next up is art I own...of me. Hooray for narcissism! This piece by Steve Becker was drawn as a FUBAR Kickstarter reward a while back. I finally got a chance to get the original art when I visited Jeff McComsey to pick up some books to take to Comic-Con. A striking resemblance...minus the beard. I'm thinking of hanging this in my office or something, just to confuse people. It's actually a page from an issue of Peter Parker: Spider-Man from the mid-2000s. I remember reading the issue this came from and being a bit surprised, because the Thing wasn't in the book at all until the last page, and he didn't really serve to move the story along at all. Spider-Man finishes his adventure and then HEY! There's the Thing. What I'm trying to say is, all books should end in this manner. The next color guide comes from Fantastic Four #362, the second page I've got from this issue. It's got that little guy from the Innerverse (or whatever) and three quarters of the FF. The last one I bought is a page from The Avengers, from the time that Reed and Sue took some time away from the Fantastic Four and ended up with the Avengers for a few issues. This page also has some decent images of Thor, Captain America and, hanging uncomfortably upside down, Firelord. Okay, one more. This isn't art, but it's close. I got a Mego Thing in really nice shape. It goes into the permanent collection, which includes everything I've ever bought. It's not a very exclusive club. Bag it and board it. Well, I'm an uncle again, and once more my sister keeps naming these babies after pop culture figures. Lilah Marie Quinn was born on July 14th and she is surely a cutie. She was scheduled to be born right as I was leaving for Comic-Con, but thankfully she decided on a date that was a little earlier so I could get a chance to see her before shipping off. So, for those of us keeping score, I've now got a nephew named Jacob (after Ben Grimm), another nephew named Logan (after Wolverine), and now a niece named Lilah, which is obviously a clever take on Leela from Futurama. Comic-Con 2014 is nearly upon us, and boy do I have some preparations to do. Lots of lettering, packing and last-minute planning is on the docket before next week. But between now and then, there's some new Tick news to pass along! 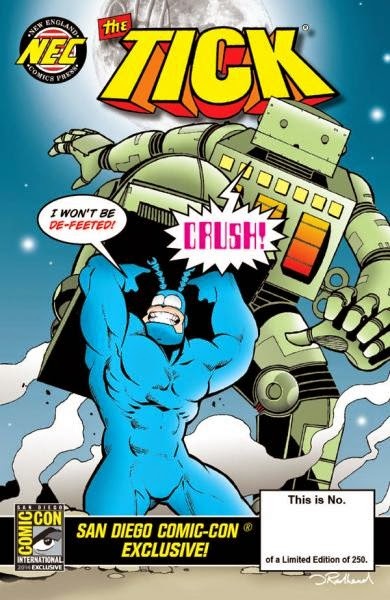 I've been lucky enough to write the 2013 and '14 Free Comic Book issues of The Tick, and I'm happy to announce that my third issue of the book will released at Comic-Con itself in the form of an issue with an exclusive cover! This one will be pretty limited - 250 copies in full. Fortunately, I won't have to fight anyone to get a copy for myself as I'll, you know, be at the booth. As far as I know, these will be on sale until they're not - meaning NEC is not going to hold books over from day to day. 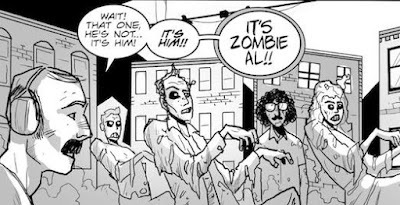 I hope they story - drawn by FCBD artist Duane Redhead - goes over well. A second, not-as-limited-but-I-guess-still-technically-limited edition will also be on sale at the show, but it's not exclusive to Comic-Con. I believe these issues will be sold in NEC stores at any of the locations. It's a 750-copy version, meaning the issue will have a total print run of...someone do the math for me. The story inside is the same for both copies! 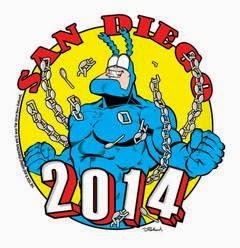 Duane also drew a really cool image for NEC's 2014 Comic-Con shirt. This is obviously a Superman homage, and the 'chain' is made out of spoons. 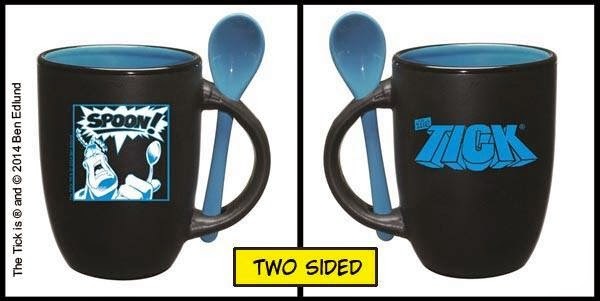 There's also a new piece of Tick merchandise that'll be available at the show: a Tick mug that comes with its own detachable spoon! I really like the design. 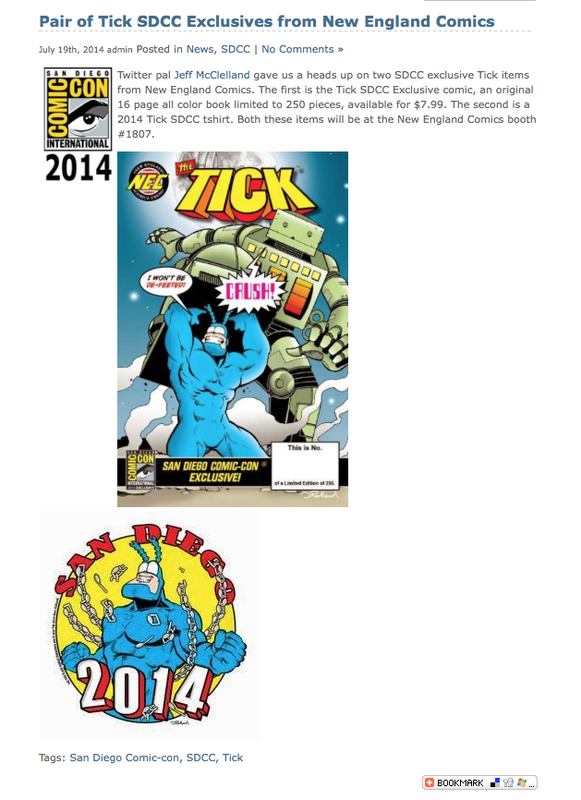 New England Comics will be located at booth 1807 on the convention floor. I'll be at the booth at various points throughout the five-day event to sign comics, hock merchandise and hang out. If you'll be at the show, stop by to say hello.